Rinse material in freshwater or saltwater prior to initial placement in aquarium system. Employ in a calcium reactor (main chamber or secondary chamber) at a total ratio of approximately 9:1 aragonite:NēoMag by volume. The rate of water flow through the reactor in conjunction with the pH of the water inside the chamber(s) will have the greatest impact on the rate of media dissolution. Follow the manufacturer’s instructions furnished with the calcium reactor to adjust the rates of water flow and CO2-injection and attain the desired concentrations of magnesium and calcium in the effluent. Measure alkalinity, calcium, and magnesium concentrations in the aquarium two- to four-times each month during the course of using NēoMag to ensure that parameters are within the desired ranges, and make adjustments to reactor system as required. As the biomass of corals and other reef-building organisms residing within an aquarium increase with time, so the biodemand of calcium, magnesium, and carbonates increases, as well; this being the case, the frequency at which aragonite and NēoMag must be replaced will increase. Note that each reef aquarium has unique magnesium requirements, and that it is possible for the magnesium demand in the aquarium to exceed the rate at which this element is liberated from the NēoMag material. Additionally, sea salt mixes are often defficient in magnesium, which puts the aquarist at an immediate disadvantage. In such cases, additional magnesium supplementation (such as with Brightwell Aquatics Magnesion or Magnesion-P) may be required to (re-)establish a natural seawater magnesium concentration (~1,290 - 1,320 ppm); once this concentration has been attained, NēoMag will generally maintain the concentration within the desired range when the reactor is efficiently operating. Another option is to employ a larger (or additional) calcium reactor to house a greater amount of NēoMag. Regardless of the method utilized, it is not recommended that the ratio of aragonite:NēoMag exceed 7:1 by volume, as this may increase the alkalinity of the aquarium beyond the desired level. Magnesium plays a vital role in reef aquaria: it helps maintain calcium and carbonate (composing the majority of measurable alkalinity) concentrations by limiting unwanted inorganic precipitation with each other. In the absence of adequate magnesium ions, calcium and carbonate ions bond rapidly, depleting their concentrations in the system and creating the false impression that heavier supplementation is required to re-establish the desired concentrations. No matter how much calcium is added, its natural seawater concentration of 412 ppm will never be sustained until the magnesium concentration begins to approach 1,290 ppm. Once the balance between calcium and magnesium has been established, subsequent calcium supplementation yields immediate positive results. Keeping magnesium within a range of 1,290-1,320 ppm will maintain the desired balance, and provides enough of the element to reef-building organisms for the formation of aragonite. NēoMag is a naturally-occuring mineral of high purity. It is primarily formed abiogenically (via a number of geochemical processes) as opposed to by living organisms (such as corals and other aragonite-secreting organisms). 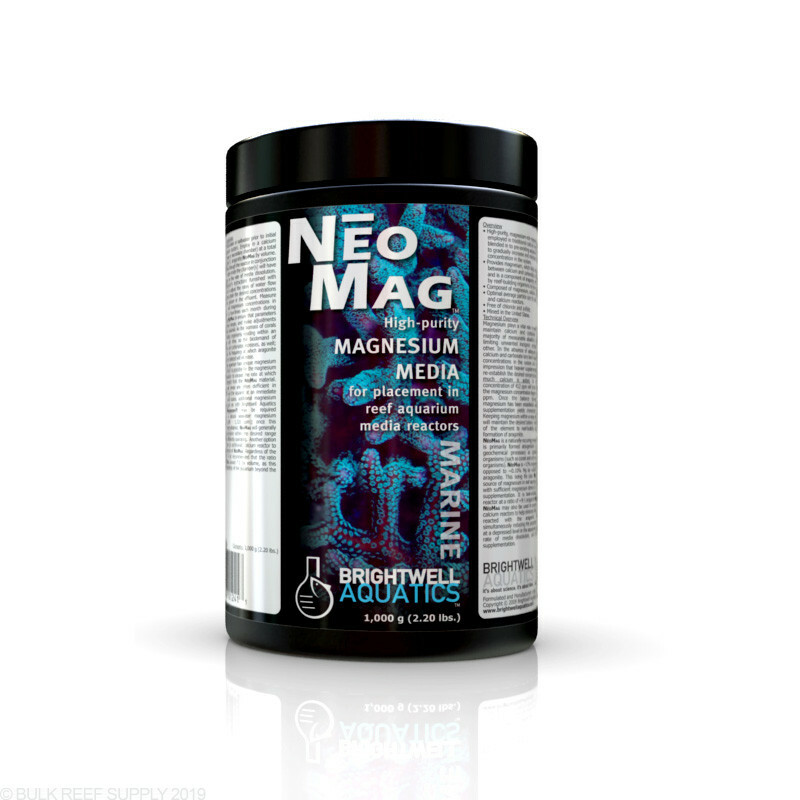 NēoMag is ~13% magnesium by weight, as opposed to ~0.10% Mg by weight (on average) of aragonite. 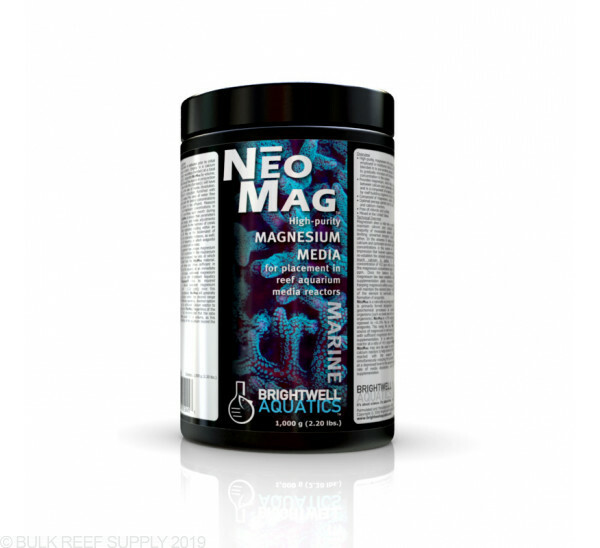 This being the case, NēoMag is a superb source of magnesium in reef aquaria, particularly those with sufficient magnesium demand to require frequent supplementation. It is best-employed in a calcium reactor at a ratio of ~9:1 aragonite:NēoMag by volume. NēoMag may also be used in secondary chambers of calcium reactors to help eliminate free CO2 that has not reacted with the aragonite media, thereby simultaneously reducing the propensity for pH to exist at a depressed level in the aquarium and increasing the rate of media dissolution, and hence magnesium supplementation.